Hello there dear friends. I have been sitting on this recipe for a while, as real life cranks up a notch and time for my little hobby baking seems to vaporise in front of me. 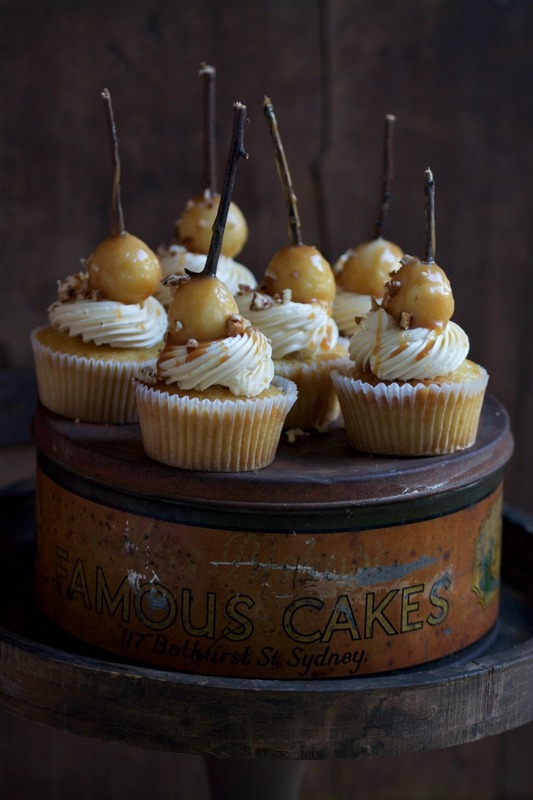 Somehow I managed to whip up these treats and photograph them on my favourite new / old rustic cake tin. 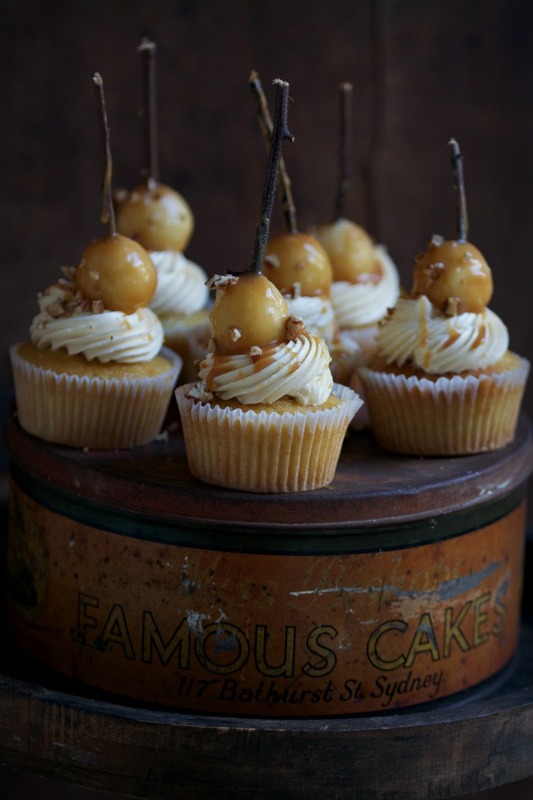 They were delicious and give a bit of a WOW with the cute mini caramel apples on top. 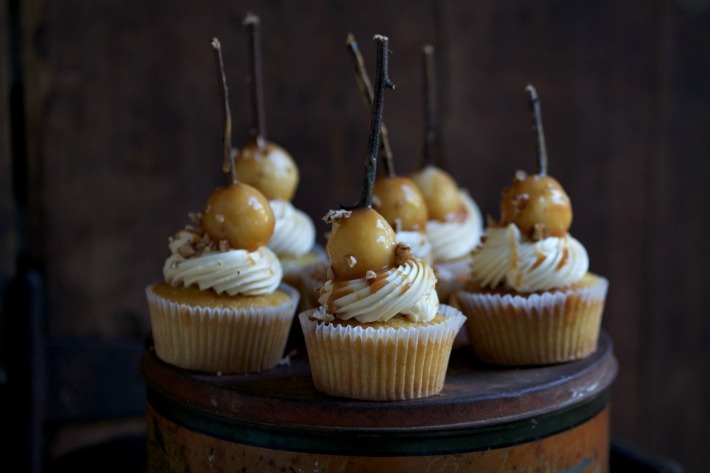 I was inspired to make these wintery Apple & Cinnamon cupcakes after watching an Instagram tutorial by the legendary Amanda from I AM BAKER , who made these mini caramel apple cupcake toppers. Mine turned out a bit more rustic (read unprofessional) than hers, but I was still happy with the overall result. I think they make a delightful addition to a simple cupcake. Basically you make balls from Granny Smith apples using a melon scoop, pat dry with paper towels then poke a clean stick into the top before dipping into caramel sauce. I had trouble getting the caramel to stick, but Amanda nailed it. 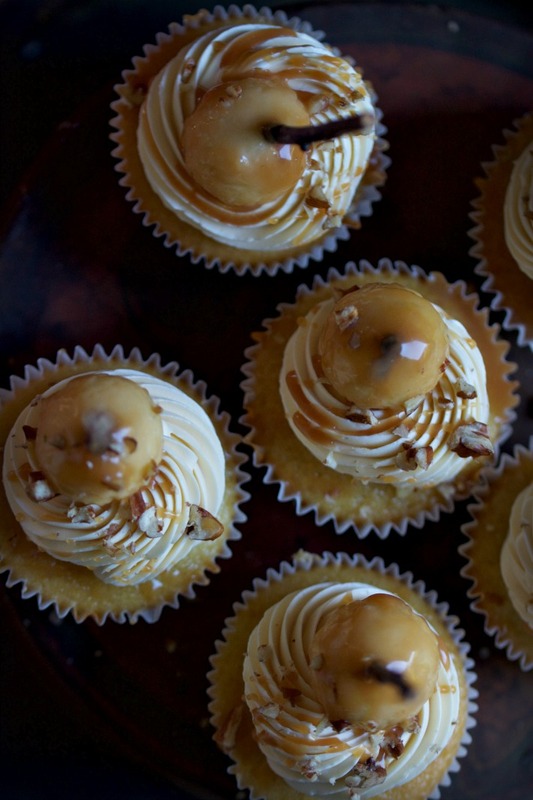 A drizzle of caramel sauce on top of caramel Swiss Meringue buttercream and a sprinkle of chopped pecan nuts and you have a super impressive dessert to take to your next family gathering. 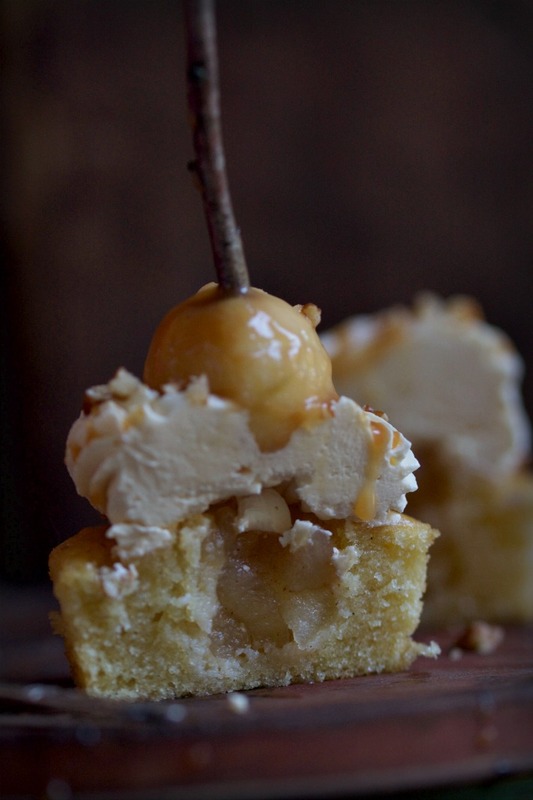 The classic winter flavour combo dressed up with a silky smooth caramel swiss meringue buttercream and freshly stewed apples inside a moist vanilla cupcake. What's not to love. In a medium bowl using a hand whisk, lightly beat together eggs, oil, vanilla, sour cream and water until well combined. In another medium bowl, using a hand whisk, combine flour, bicarb soda, baking powder, sugar and spices. Pour wet mixture into dry mix and whisk together until well combined. Scoop into prepared cupcake cases and bake in a moderate oven for 18 - 20 minutes or until slightly brown and firm to touch. Leave on a wire wrack to cool. When cooled, using a serrated steak knife or large icing tip, scoop out the centre of each cupcake and put a teaspoon of cooled stewed apple into each cupcake. Frost with Caramel Swiss meringue buttercream. Peel and dice two Granny Smith apples. Place apples into a small saucepan and just cover with water. Add a teaspoon of cinnamon and mix to combine. With stove on low, leave apples to stew until soft, about 10 - 15 minutes. Leave to cool in saucepan until ready to put into cupcakes. 1/4 cup butter. Set aside. 2/3 cup heavy cream. Set aside. In a medium saucepan on medium/high heat, place 1 cup granulated sugar, 1/4 cup water, 1/2 teasp salt. Whisk together continually until it begins to boil., then allow to simmer until the sugar turns a rich amber colour. Swirl the pan if needed. Remove from heat and immediately whisk in butter then cream. Be careful, it will steam up and be quite hot. Allow to cool slightly before putting into a glass jar and refrigerate until needed. I use the small batch (6 eggs) and reduce the butter to 450g, which is 1 1/4 blocks. I also reduce the vanilla extract to 1 teaspoon.